The ingredients and procedures below are based on Madelain Farah's recipe in her excellent book Lebanese Cuisine, and the photos show that I doubled the amounts when I made it. 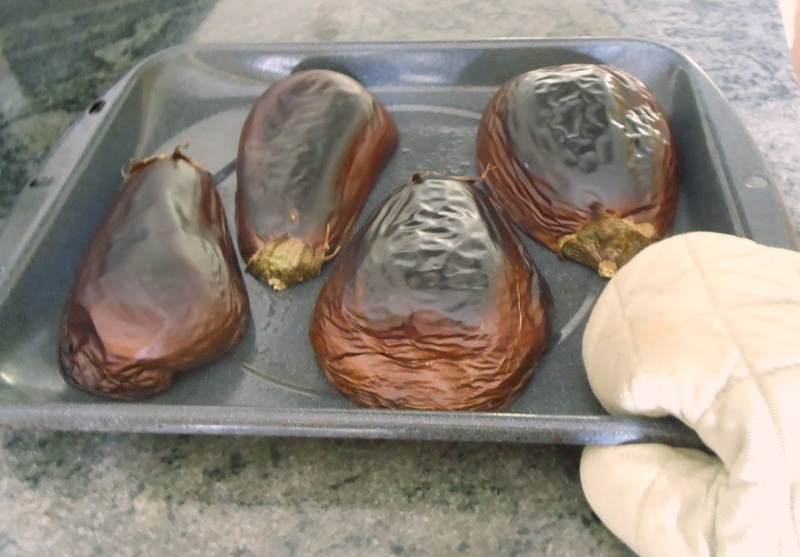 Tori Avey's web site gives detailed instructions on how to roast eggplant using different methodologies. Wash the eggplant and cut it in half lengthwise. 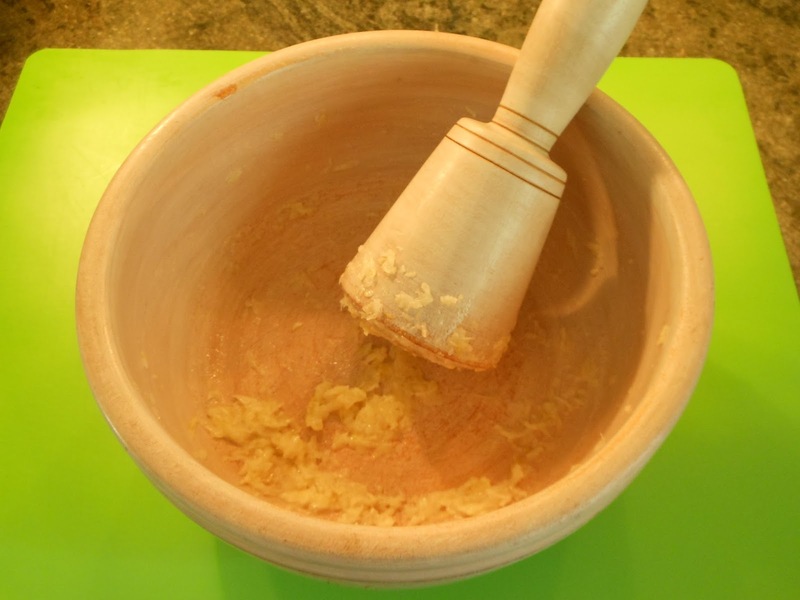 Spray or lightly smear a broiler pan bottom or similar flat, shallow pan with cooking oil. Lay the eggplant halves face down on the pan. 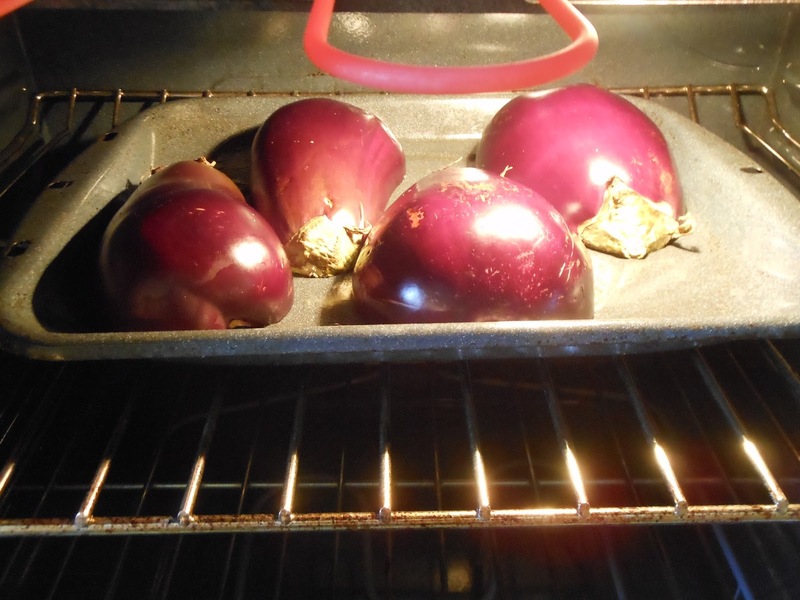 Turn the broiler on high and place the eggplants about 13 cm (or 5 inches) from the broiler element. Roast the eggplant for 30 to 40 minutes, or until the skin is blackened and the flesh is mushy. 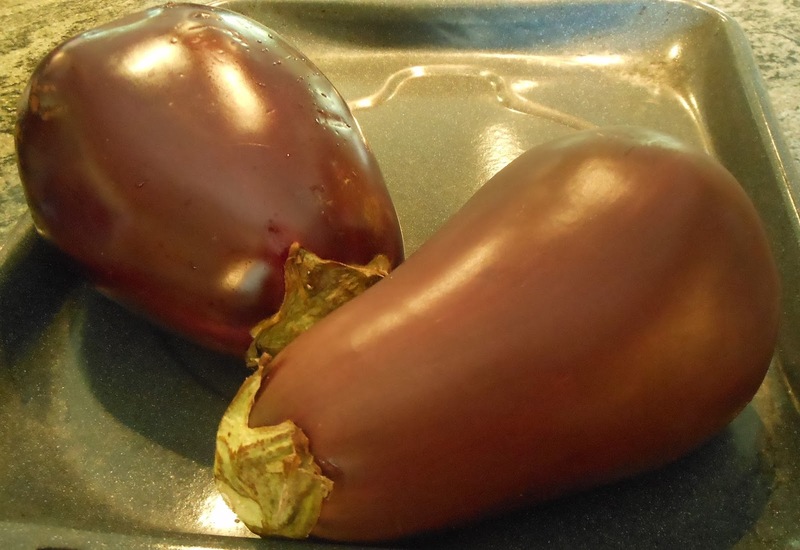 Allow the eggplant to cool at room temperature. 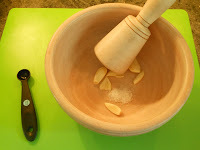 When the eggplant can be handled without discomfort, scoop the flesh into a bowl or similar receptacle. 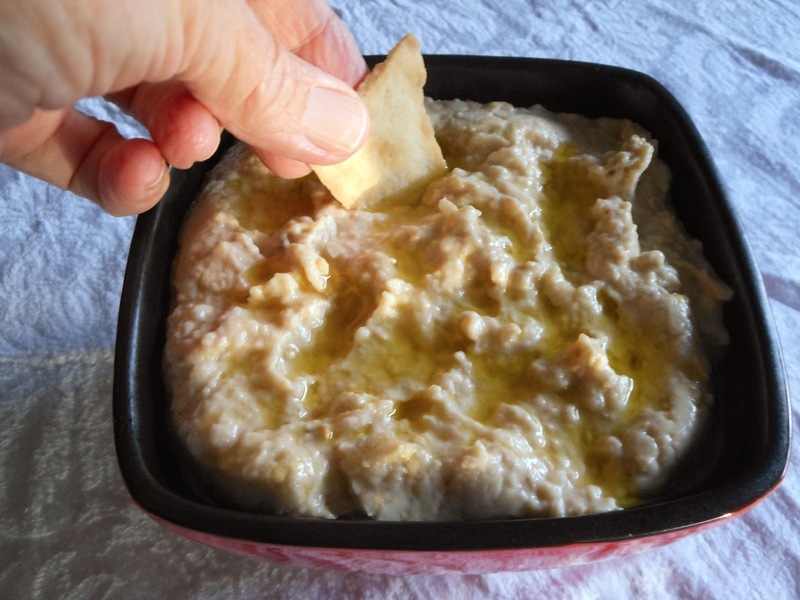 You should have about 250 to 300 ml (or 1 to 1½ cups) of eggplant. Add the eggplant, sesame tahini, lemon juice, and Cayenne pepper, and continue to grind with the pestle (or mash with the fork, or pulse in a food processor) until the ingredients are well mixed and the eggplant is not lumpy. 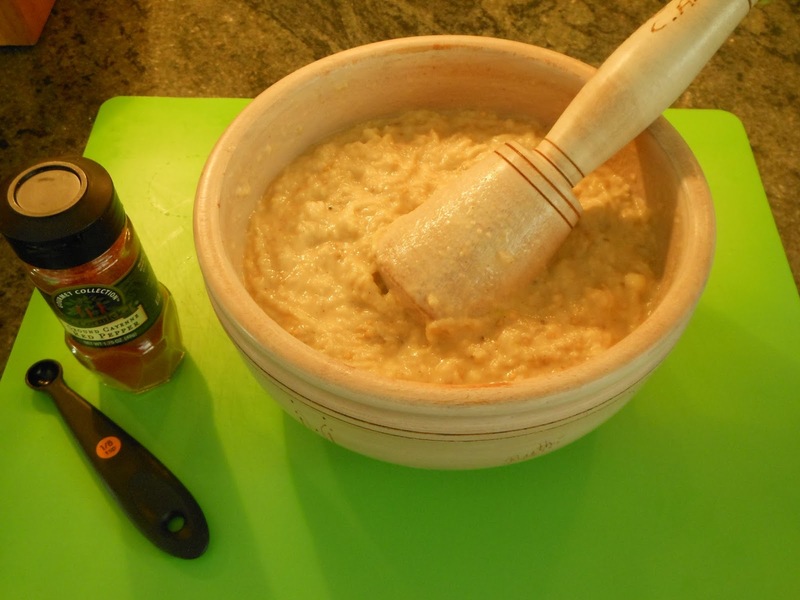 Just before serving, drizzle a little salad-grade olive oil on top of the baba ghannuj.